Even though I have 13 years of experience as an educator, I am somewhat of a “newbie” this year. After working at the same school for 11 years, I will be working at a new school this fall. I’m transitioning from a private school to a public school. I will have new administrators, new colleagues, new expectations, new responsibilities, a new (and longer) commute, a new sign-in time (which is earlier), new procedures, new acronyms to remember, new paperwork procedures, etc. It can be quite overwhelming if I let my mind go there. Now think about a child who will be starting school soon. He/she will be experiencing many of the same things…especially if it is a new school. There will be a new building to navigate, new teachers, new classmates, new expectations, new responsibilities, new activities, etc. So…what can we do to make it better? Learn as much as you can BEFORE school starts. Look through the school’s website. Many schools will include details on their website, such as the school’s history, videos and photos of fun events, a newsletter, information and pictures of the administration and teachers, the lunch menu, the schedule, etc. There is so much you can learn ahead of time just from the website. Also point out any “landmarks” that you notice and talk about the importance of them. For example, “Look at that flag painted on the wall. It is right outside of the library.” Doing this type of “walk-through” was one of the most helpful things that one of my new co-workers did with me on my first day of pre-planning…and it kind of happened by accident. She was telling me that I would need to get a copy code for the copiers. I added that task to my list and then asked where the copiers were located. It hadn’t really dawned on either of us that I would need to know little details like that. Focus on all the positives of this new experience. It’s an opportunity to make new connections and learn more about different people and topics. However, don’t dismiss any of your child’s concerns. Listen to them and try to help them think of possible solutions. You could talk about different ways to address their concerns and give suggestions on how you’ve handled a similar situation in the past. A little empathy can go a long way! Starting something new can be a little scary (even for adults). 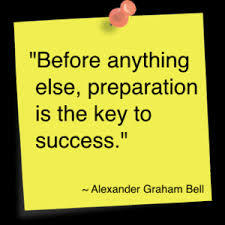 However, I believe that a little bit of preparation and positivity can go a long way. What are some things that you do to get your child ready for the new school year? Pointing out landmarks is a good idea, because they are easily recognized by kids. Sometimes numbers and words can get confusing and/or forgotten…ie, classroom number. It’s unbelievable to think it’s almost that time of year again. Summer has gone by too quickly! I go back to school on July 27th.